Getting Crafty at Maine Camps! Camp in Maine is truly a hands-on experience – one of the huge benefits of camp is the wide variety of activities, and for those kids with an artistic bent (or those who just like to have hand-on fun), the incredible crafts opportunities at camp provide ample opportunities to flex those creative muscles. Like many other aspects of the summer camp experience, Maine Camp Experience (MCE) camps have developed programs that combine the best of old-fashioned arts and crafts with exciting new activities that give campers the opportunity to truly make something special. So what does a summer at an MCE camp have in store for a crafty kid? Of course, one of the staple activities at just about every MCE camp will be traditional arts & crafts – in these activities kids will draw and paint, create old-fashioned favorites like tie-dye shirts, and have plenty of opportunities for the kinds of creative output that has been a part of childhood for generations. At the MCE camp I work at, the arts & crafts activity will also include more eclectic forms of artwork, like using the loom to create beautiful woven tapestries and other fabric pieces. And of course, one major project that almost every camper is a part of during their camp career involves painting the bunk plaques that immortalize their summers. 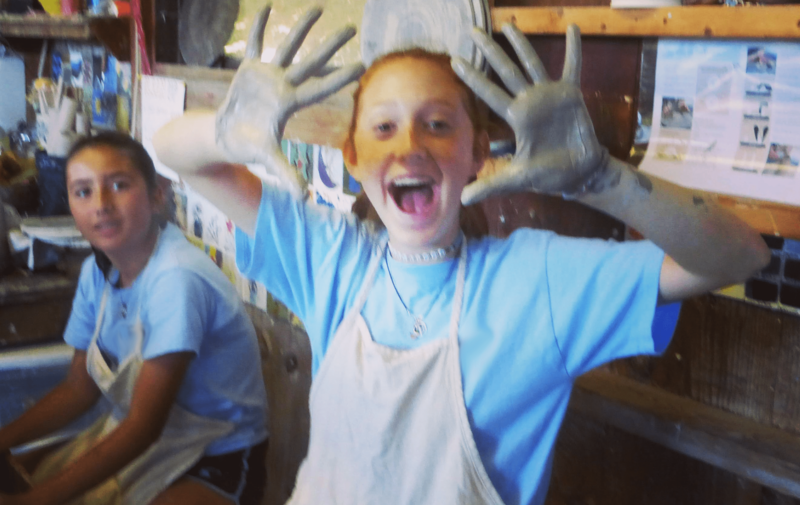 Many MCE camps also offer well-developed ceramics programs, where kids can not only throw pots by hand (and fire them in the kiln), but can also learn how to use a potter’s wheel to create fascinating, symmetrical pieces like bowls and mugs. But crafts offerings at MCE camps extend well beyond simple arts and crafts or ceramics programs that have been a staple for years, and there are a number of niche crafting activities that give kids the opportunity to create art in unique mediums. At many MCE camps, woodworking is a popular activity – kids make all kinds of impressive items, from small trinkets to larger functional objects like boxes or even chairs and tables. Camps that offer woodworking are sure to stress the important elements of safety – they make sure campers wear the proper gear, that they are using tools that are appropriate for their age, and that they know how to use all tools they’re using properly (and are properly supervised throughout). Other unique crafting activities at MCE camps include candle-making, blacksmithing, and stained-glass making. In each case, campers are given specific instructions and supervision – but they are allowed to experience firsthand the exciting experience of making beautiful works of art, and the fruits of their creativity are proudly displayed for other campers and staff to admire. At the MCE camp I work at, one of the most popular activities in camp is jewelry-making in the camp’s silver shop. In this activity, girls make all sorts of camp-themed pieces, from rings, bracelets and necklaces to pendants and charms. They start with a thick silver strip, and using pliers, hammers, and heat, and acid, undertake each of the steps required until they have a finished piece of unique jewelry – this is a really empowering activity for our campers, and there’s nothing like a completed project to give a confidence boost. Once again, safety and supervision are of paramount importance and are treated as a first priority, and camp’s silver shop really does represent the welding of safety and fun! Of course, jewelry is not the only thing you can make and wear at camp. At another MCE camp nearby, there is also a very well-developed fashion design program. Campers will create their own shirts, skirts, and dresses from scratch – starting with pieces of fabric, they will learn to sew and fit them together. They use mannequins to model the clothes, which are oftentimes worn for special camp events (and might even be used in theatre productions). These become wonderful one-of-a-kind outfits that make amazing gifts or tokens to remember summer by. For a hands-on kid who wants the experience of crafting unique artwork, there really is nowhere better to spend summer in Maine. From traditional arts and crafts to unique mediums like stained-glass, jewelry making, or candle-making – and everything in between – MCE camps really do offer the gamut of visual arts experiences. So if you’re feeling crafty, put those hands to work and head up to Maine to enjoy the amazing craft activities at MCE camps!